This entry was posted in Uncategorized on November 27, 2016 by Gary. A bumpy road ahead, Gold at 1150-70 before a turnaround, GDXJ and SILJ still at 50% I would like to see them at 61.8% before a turnaround mid December. and yes I support Gary’s view in his latest chart. May be. Steep rise in YCS, until it relents, could be a significant headwind for a potential bounce in gld/slv. It is axiomatic then there is still some unfinished business on the downside for pm complex. Whether it is a complete retrace or a partial retrace is a matter of opinion. None can pinpoint the future that accurately on a consistent basis. However, mid January 2017 would be one year anniversary date. So it would not be a miracle, should a turn happen close to that time slot. As we near that point, there could be many signals on key pm charts plus currency charts. Hot money fled the pm complex around August and flooded into undervalued base metal complex pushing up their prices. Once prices are pushed there above intrinsic value, hot money could return to the undervalued pm complex. By that time, all the bullish sentiment will have been squeezed out to the vanishing point. And the price elevation cycle begins: rinse and repeat. Nothing new. Cheers. So here are three gold charts Daily, weekly and monthly showing MACD, RSI, Stochastic and TSI. For your own conclusions. So where was the cycle low in 2012/2013? I can’t see an arrow. If only looking at other peoples charts/ewi analysis, and cycle analysis yielded consistent accurate results…..Find me five you tube videos saying gold is going to $1550 i’ll find you five saying its going to $800. I have to disagree with Gary big time and criticize him. Hes really full of it to say the rally off election results were manipulated. Off the lows is becos of banks stocks. Bcos market knows Dodd Frank will be removed. This regulation is super bad for business. Every time wrong about SM must be manipulation. Sometimes could be. But not this. The market was due to rally soon after the election but … markets don’t behave like that. Crashes play out over several days. The market panics then over the course of several days emotions calm down and traders start to think clearly. 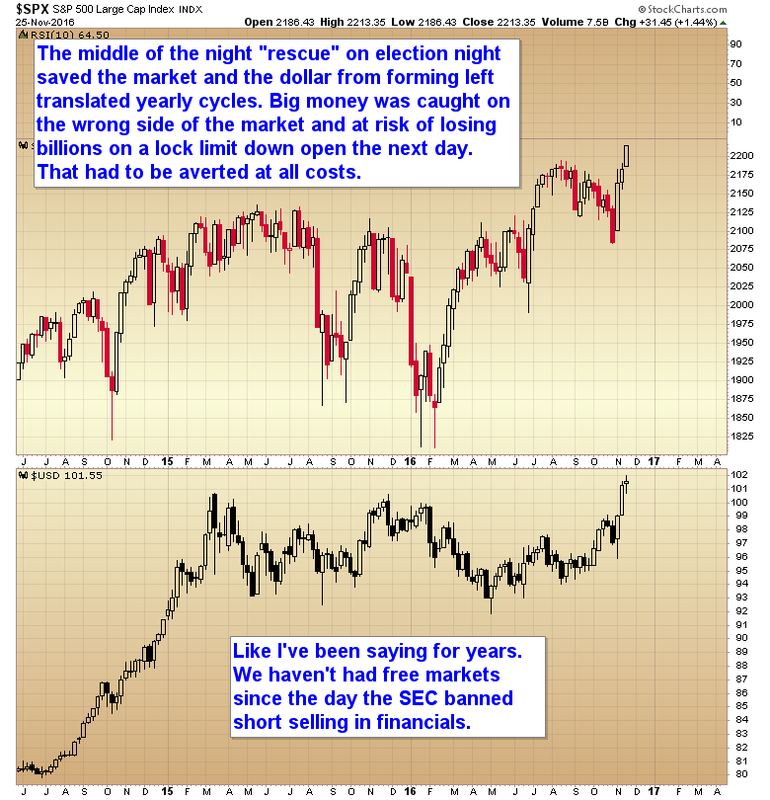 Did the market reverse in the middle of the night after 911? No of course not. Human nature never changes and you aren’t going to convince me that it all of a sudden changed the night of the elections. Stocks were in a left translated cycle. The knee jerk reaction was for stocks to crash. It should have played out and dropped below the Brexit lows completing the left translation. Then momentum would have slowed and price turned back up as traders calmed down and started to evaluate Trumps policies and the likelihood of them being implemented. Wrong. It’s not that smart money supported the market when they crash, conversely, I could argue that smart money deliberately crashed dow futures 900 points. They know the press has been broadcasting that if Trump wins, market will crash. This statement is politicians trying to get Hillary to win. 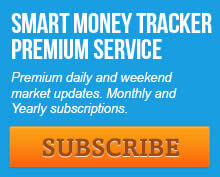 Smart money, then use the results to crash market, then scoop up those shares cheaply. Also bottom line is, right is right, wrong is wrong. Ignore those manipulation nonsense. U mean I can tell my broker that bcos of manipulation, I don’t have to pay for my losses? Gary has no idea where anything is going. All he knows is that he will pull out the manipulation card when he is wrong which is very often. A coin flip will probably outperform Gary in all asset classes. For what it’s worth I recognized the reversal was going to cause the ICL to occur early and got subs back into stocks very close to the bottom. We now have a trailing stop protecting that position in case the market turns back down. I also suggested a stop right below 1275 on metals positions. Now waiting for a weekly swing before I give the signal to jump back in. Gary I am not even only referring to your gold calls (yes you did say put a stop below 1275 but by the way you said you did not think gold would go over 1275 then it rallied into the 1300s on the Trump win so you are not even telling the complete story here as you pick and choose what you want people to hear). You constantly flip flop on the s+p. One day you say it will go much lower then next it will go much higher. Make up your mind otherwise you provide no actionable service and quit blaming everything on manipulation when something goes opposite to what you expected. I explained that I have long dated options. Selling those is not a viable strategy. This is why I bought a ton of time in case I had to weather another Daily cycle. There is no reason one couldn’t stop out of leveraged ETF’s and wait for the ICL. We never got a chance to stop out as no dCL’s had been broken until the premarket attack. At that point the gap down had already caught us. There was never any chance to stop out. I waited for the bounce out of the DCL and then suggested a logical stop at 1275. That was a better stop than selling into the gap and a higher stop. This is the difference between trading in hindsight, and actual real time trading. We got out as best we could considering the gap down in early Oct. I see the Gary bashers are out in full force today. To all you bashers: Gary has made many great calls in the past and continues to do so. He is one of the best. I’ve make money following Gary – lots of money. I have lost count of how many of these charts I have seen from Gary that turned out to be all wrong. He has no idea where anything is going as his cycles are a mess and he bashes TA yet often uses TA himself to try and convince others that he knows where things are going. He has no idea where anything is going and all his cycles and TA amounts to nothing more than hits and misses with many more misses than hits over the course of many months now. He claims to be a multi millionaire who does not need any more money. He then charges $200 for subscriptions. In the last 6 years he has got almost everything wrong on Gold. He has claimed Dollar will crash at least 15 times in the last 6 years and we know how that turned out. So after that…anyone who pays for his subscription, truly deserve what they get. Actually the stock portfolio is up 73%. The metal portfolio is up 53% (even after the drawdown). The Quest portfolio is up 1700% as of the last completed trade. The currency portfolio is down 1%. And the energy portfolio is down 13% (I haven’t had any luck at all trading energy. All in all I would put those results up against anything you’ve produced over the last two years. Continue maintaining that tracking so we can see in a couple of years where it stands. After calling 50 bottoms in the last 5 years you got one right and it turned to be a barn burner of a rally. So go back to your 2011 “We are going over $2,000 folks” or your 2012 “I am expecting sideways in Gold and a crash in the stock market, or your 2013 ” Gold is about to break free of the manipulation” or your 2014 “The dollar is about to crash” and plug in those trades and if you (your subscribers?) have a portfolio left, we can discuss it. Yes that’s when I stumbled across this site is when the stars finally aligned for Gary this past February. Thought I found a new guru that was on top of his game so I subscribed. I then read thru the archives and pretty much found out the same thing as you, same calls over and over all the way down. It was when I discovered the whole Toby Conner thing that got me distressed thou, running 2 websites with the same content under 2 names. Now that is BS. There is nothing wrong with making a wrong call as long as you can admit it and reverse direction as soon as possible but sitting on a wrong call and too stubborn to do the right thing is another. Glad you saw the truth. I too have no problem getting stuff wrong. Hell, I have made some really bad calls, specially in 2008. But turning around and reframing it to deceive people….that is unacceptable. Beyond that, he goads people himself when he is on a hot streak and makes fun of their inability to make money in the market forgetting that his portfolio would have been wiped out 5 times over between 2011 and 2014.
who was the single analyst to call the low in gold last november…???? Gary has made many accurate calls on the metals and other markets recently. If you cannot see that then you have a neurological problem. Gary shares his trade’s ideas. Let’s take it and use it in your own manner. It’s not fair to trash him eachtime when there is a wrong trade. Trade with your money so you are your own boss. Du Du it is one thing to share ideas and be wrong but another to never admit to being wrong. Also he would make fun of subscribers when they were in huge draw downs because of him saying that to make money one needs to learn to take big draw downs so folks needed to quit being babies. He is very irresponsible and always blames manipulation when things go against his forecasts. He bashes TA when his cycles are often much less reliable. He constantly gets oil wrong as well as gold and as for the stock market he flip flops every other day so there is nothing actionable about his predictions. He can forecast a market correction and when it does not come he will just say it was manipulation as opposed to manning up and admitting he got it all wrong like he has so many times with so many asset classes. Completely agree. But how do you expect someone who sells subscriptions to ever do a Mea Culpa, especially when 90% of his subscribers are more likely to believe Gold is Manipulated rather than the moon landing really happened? In your recent video blog Gary you noted you were expecting a market correction between now and Inauguration. When it does not happen will you again cry manipulation? If you know the market is manipulated why do you ever call for corrections? It’s so simple. If you don’t like Gary’s analysis then don’t come here. GO AWAY. Man alot of trashtalking! Glad I’m not on anyone’s wrong side. On a different note anyone know what happened to traderdans website? I used to follow him alot b4 he started to charge subscription. Looks like his site shut down? Tough crowd this morning. Garys returns are good unless you began following over the summer. Different perspectives are important for this blog. Bashing Gary is not helpful. State facts but keep it civil. Some subs need to see other opinions to help them avoid blindingly following Gary. I learned this lesson and now I am a better trader. Pull up your pants and keep your comments respectful folks. Absolutely, I agree. What appears on any SM site is just the opinion of the analyst at that time. Nothing is guaranteed. Anybody who decides to trade based on it is responsible for his own actions. If anyone is dissatisfied, there is the option of cancelling the subscription. All subscribers should read the legal fine print and abide by it. Yes I agree! You can use people’s wisdom and make up your own mind ! All gets caught in emotion when the bull seems storming. Everyone has his own point of the trade as I over the past year look at diverse specialist fields of analysis. I judge on the diverse opinions who I follow. Some see resistance levels better, the macro environment, ect. You have to adapt your plan with the diverse info and you can not blame anyone. each one believes his insight accommodate all variations. So pich yours. Gary made some great calls Labu at 19 he said it would go extremely higher and it did. He was the first to call the breakout in silver this year… he makes one bad call to buy Jnug at 23 ( although he did say a few days earlier he did not want to get caught into a ICL that would be nasty)….. this one call has cost him a lot of subs….. the lesson don’t trade leveraged funds …. without a stop …. I know you can get stopped out of your position or get chopped up but it is better than losing 75 to 80% of your trade. Yes, risk management is a must, leveraged or otherwise. I f you lose 50%, you need doubling to recoup. That is tough. I did stop out at 1275??? At that point the metal portfolio was still up 53%. I don’t know anyone who would be unhappy with 53%??? Now I’m just waiting for a weekly swing to buy and make back the losses on this trade. Leveraged ETF’s can rally an insane amount during an intermediate cycle. The last rally sent NUGT 1000% higher. Actually if you got out at 1275 it would be 50% loss on that trade. If you held on then it would be 75-80%. Even Rambus has his charting showing that this might of been just a bear market rally and we will probably hit new lows next year…. “gap down is a continuation gap”. With the sentiment this extreme we may get a bounce into January….. but ycl will determine if the bull is alive or going to get mauled by bears. I think the problem is most of us here focus on gold way too much. I myself have been obsessed with gold and it has cost me dearly. Let’s be frank, gold has been much much more difficult to trade and call correctly these last few months. Alot of Whiplash. It looks like it’s time to focus more on the other markets like stocks, oil. Less stress. 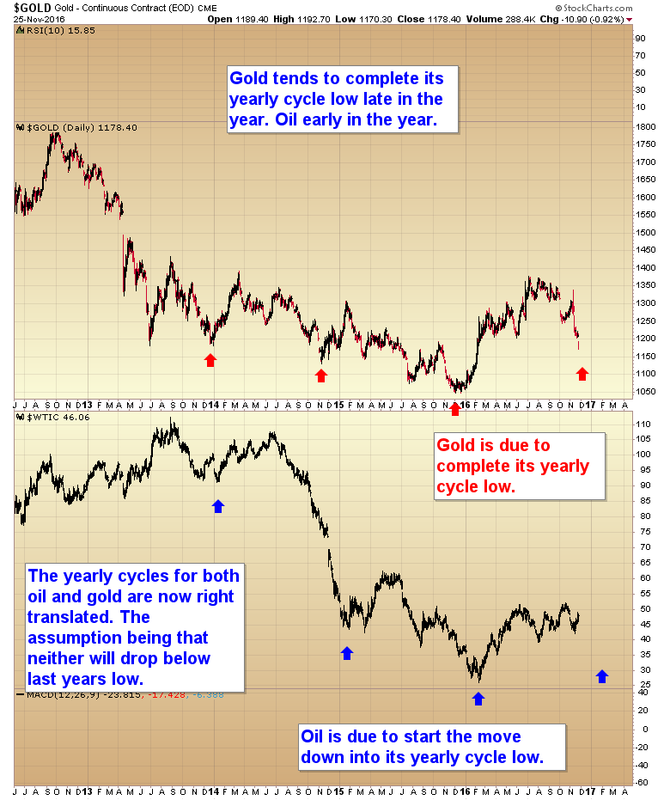 Prbly only allocate 10-20% towards gold/miners. My point exactly. It is important to monitor sector rotation constantly. Hot money left bloated pm complex and flooded into undervalued base metal complex after Aug-Sept period. When prices in the base metal complex get elevated, money will flood back into pms. Nothing new: wash, rinse and repeat. There were good trades in financials, semis, insurance, consumers, manpower, advertising and media relations, etc. even 2-3 days after the election. Bringing in market manipulation, etc. is a red herring. Gary should encourage his subscribers to do proper risk management. we are very close to a turnaround in Gold, next week is key! Interesting. It does not tell you, however, whether it is a bounce or an intermediate bottom. Let us wait and see for signs in currencies and several key charts. obviously many here like brian lost money following Gary’s calls, some still believe he will eventually be right To follow anybody claiming to have the secret sauce when it comes to markets is ridiculous. The fault lies with those who blindly follow not the one’s provide the advice. For the vast majority of subscription based analysts, their income is derived from advice giving and not personal investment in their own advice. Guys like Prechter have been wrong far more than right for decades, yet continue to have an audience in spite of their market advice to the forever hopeful with authoritatively written nonsense based on some graph or statistic to falsely validate their claims. To believe these claims you have admit to believing in claravoyance. This does not however detract from a free site like this to share ideas and opinion and comparing the results. Very well put. None has a crystal ball. None has a special line to future price activity. Whatever you see here are just opinions, which may or may not pan out. Not investment advice. I agree most of these Guru’s are wrong way more then right. Not sure why people keep feeding them money cuz if they do their own calls will be right just as often. Eg Tim Wood, Peter Schiff, Gerald Celente among others. They have been wrong for years but still manage to have people shell over their hard earned money to be placated. Interesting. One needs to be open to the possibility for a complete retrace to 1050. I have a quick question for you guys: will the results from the upcoming OPEC meeting have any effect on Copper or gold? If so, what would that effect be? Thanks in advance for your opinions! Anyone that looks at the SM price action at the election knows that the PPT where up all night doing their stuff. If they were not they would not be doing their job and should be sacked. ALL markets are manipulated. Get real folks. BOJ admits publically to purchasing etfs that purchase stock…and that is only what they are admitting to, to the public. I have been expecting a correction all summer. Perhaps is coming now. Hard to predict anything as every timescale seems to get stretched or squashed as part of the manipulation. Big picture is that you are in the bull market of your life time. You will not see one like this again. Most hated all the way from 2009.
still 70% loaded long stocks. If you are trading 3x etfs please EXPECT 50% drawdowns if you get it wrong. That is what they are designed to do… they make your portfolio look finished and covered in red ink….hopeless…desperate. They are designed to make you bail out. Yes, over 6 months they can lose 50% all buy themselves but remember if you get the direction correct, they can also jump 20% overnight. Quite frankly some people on here should just go shopping and buy a set of balls. Or take up chess. The gold price is not going under $1050 for any length of time. Under $1050 the demand is limitless. Russia just purchased 48 ton of gold last month at these prices. And that is what they are admitting to in public. The west is stuck. if they lower the gold price, it will just go east in truckloads. They therefore have to use Volatility…take it up….bring it down….take it up again…down and down ….then up, to wash everyone out. So in despair they give up and just buy “apple” and go back to watching the ball game. Thanks again Gary for sharing your thoughts and your endurance. Here is a suggestion for Gary. Why not market a “Trade Day Special” where everyone (and there are a lot of experts on here with a lot of experience) posts there favourite “Rock” junior stock that they think will do best in 2017 and a description as to why they think so. This will give the comment experts here a chance to show everyone what they have got. I know you don’t trade stocks yourself Gary but it could be fun and an early Christmas present for 2017, as well as driving traffic to your site. It will also be fun to evaluate the % gain (or not) of all the comment experts “Rocks” at the end of 2017. Anyway good trading, be careful out there. (Special thanks to Alex, like your style, hope it works out for you). 95% of the world pays for Gold in some other currency and that amount varies based on the exchange rate. Calling a floor on the Gold price would be difficult for me because of so many unknowns on exchange rates. Even if it does, it is not going to stay there for long. We will know, if we take one day at a time. No rush. This is reminiscent of four years ago. Bagholder part deux. I will hold for 1550 in gold and get out with a small profit. Technically we’re still in a bear market….i can draw trendlines. Yes — swing trading is correct for gold these past, present, and future several years. Old Turkey is going to be a disaster. I told you I saw a triangle forming during the month of September, and that it would break down, with the 200 day SMA as its target. It’s ironic, because YOU are the one who turned my attention to the 200 day/week SMA’s exactly one year ago. Actually, I first came upon Gary in October, 2012… !!! I remember you from back then. Long time. Once my shares are back with the brokerage house I intend to trade them out. Look forward to your insight and all others here. Haha dude. DO you need to see it again? I was short. Covered all and went long. Sold all my longs as well. You can look to the comments November 13th. Made 30% on the short side and 4% on the long side the last 4 months. Yen is falling like a rock but Gold has not got the Pro-rata bounce. There is not much fun on the long side on Gold when Oil stocks are still tradable. You will get your 1 handle on GDX like I said, but I personally am no longer betton on it. Currently. U could also short here shouldn’t matter if u think 1050 is next right? Sure. But I think you re confusing my calls with someone elses. I think, and you can kind 4-6 comments from me backing this up, a long term bottom is likely to form at $1.140. However I will have to see where the Commitment of Traders and other sentiment measures are around there. What I think is going to happen, does not necessarily dictate my trade. I will take only a what I think is a high probability risk reward trade over whatever time frame, short, medium or long. At present neither side appeals to me to so I am flat. A bounce is possible. No idea about its amplitude or duration. My opinion. We are still in a massive uptrend for gold that started in 2000. 2011 – late 2015 was a protracted correction. This huge move from Jan 2016 to this summer was back in the primary trend and these last 3 months a correction. The 11 yr uptrend was massive. The multi-year correction was massive and somewhat overdone so the bull resurgence this January was also massive and somewhat overdone and it’s correction is going to hurt especially if you are holding 3xbull etfs. When gold turns back up again it’s going to be a massive move. It signifies decreasing faith in governments and paper money around the world. This is what has been going on since 2000 and Greenspan “saving” the US from the stock market bust. Gold is doing what it’s done for 5000 years. Saying I’m sorry you can’t really have something for nothing and create wealth out of thin air. The hour is late. Everything is not hunky dory. Inflation expectations are rising. Any reason why XLE drops 1% on a day when oil gains 2%?